Hair loss can happen to anyone regardless of gender and age. To treat hair loss you can opt for mesotherapy that is a non-surgical and non-invasive technique. Suitable for both men and women this therapy can be done on various hair loss issues such as male/female pattern baldness, alopecia or hair thinning. You can find many clinics in Nottingham that offers mesotherapy under professional guidance. Mesotherapy is a popular, non invasive procedure which is based on superficial microinjections, below the epidermis targeting the largest tissues. The solution which is injected contains a wide range of variety of minerals, vitamins, acids like amino and nucleic and co-enzymes which can be tailored to individual patient’s personal needs. Since this procedure is absolutely painless, no dressing or anaesthesia is given to the patient. After the treatment is over, the patient can join back his work and follow his daily routine. Who is eligible for mesotherapy? Both men and women at early stages of androgenic alopecia are eligible for mesotherapy. The patient needs to be in good health for being able to undergo this treatment. For further detailed scanning, physicians and medical consultants can be contacted who can study the patient and know if any kind of allergy or infection is present. What is the procedure of Mesotherapy? This treatment is meant for those who are suffering from hair thinning problems. If any patient is suffering from complete baldness, then this non surgical treatment is not suited for him. In this painless procedure, FDA approved ingredients like vitamins, minerals and proteins are injected into the scalp of the patient, in order to improve the blood circulation of that affected area and to give a vitamin boost. For quick and better results, it is recommended to take 6-8 sessions of this treatment. This highly beneficial hair re growth treatment is gaining a lot of popularity. Who should not opt for Mesotherapy? Since Mesotherapy is a non surgical and safe treatment for hair re growth, the patient can undergo other treatments along with it, but these necessarily have to be non surgical in nature. Examples of it can be Minoxidil and Finasteride. This treatment is meant for men who are specifically suffering hair thinning problems and pattern baldness. For complete hair loss problems, one cannot go for this procedure. For women dreaming for stronger and thicker hair, mesotherapy is the best treatment for them. It also works best on those women who are experiencing hair losses because of hormonal imbalances or heredity reasons. Do not wash your face for 3 hours after the completion of the procedure. Might experience temporary swelling which will subside after few hours. Today, one of the major concerns is hair loss that is no more associated to age. Therefore, to treat hair loss mesotherapy is the right procedure. Those who do not want to opt for a surgical procedure can opt for this one. 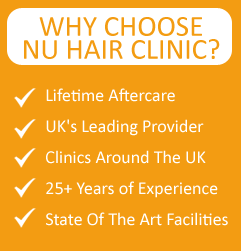 Nu Hair Clinic in Nottingham is one of the best places to undergo mesotherapy that offers state-of-the-art facilities within budget.